These three manual digital instruments are wonderful to play and listen to, and with a choice of snow-white or walnut polished finish, it will also be the center piece in any music or living room. Tibia Drawbars, adjustable presets, General MIDI, disk drive, great orchestrated accompaniments, padded bench with music storage, digital Leslie speaker in a high polish white or hand rubbed walnut -with burled music desk – cabinet. Most important: These organs are still fully supported by Organ Stop and are currently available in the two colors shown below. Call for special pricing on XR-9000 organs. This entry was posted on January 22, 2019, 8:30 am and is filed under Kawai. You can follow any responses to this entry through RSS 2.0. You can leave a response, or trackback from your own site. 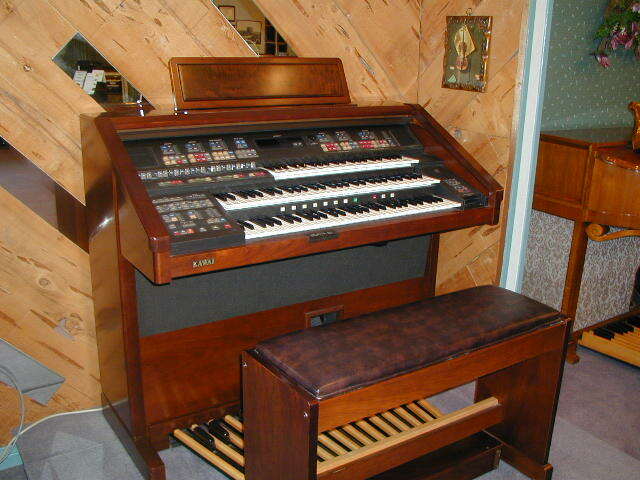 OrganStop.com is owned by Organ Stop Inc. All rights reserved. All corporate logos represented herein are the property of their perspective owners. Organ Stop Inc. is the exclusive authorized dealer for Allen institutional and home organs and Lowrey home organs for the San Diego California area.